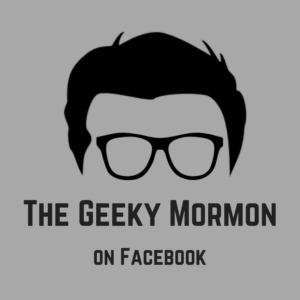 It has been quite a while since I last shared a geek-craft here on The Geeky Mormon. I thought it was probably about time I shared another and hopefully I can make this a more regular thing. 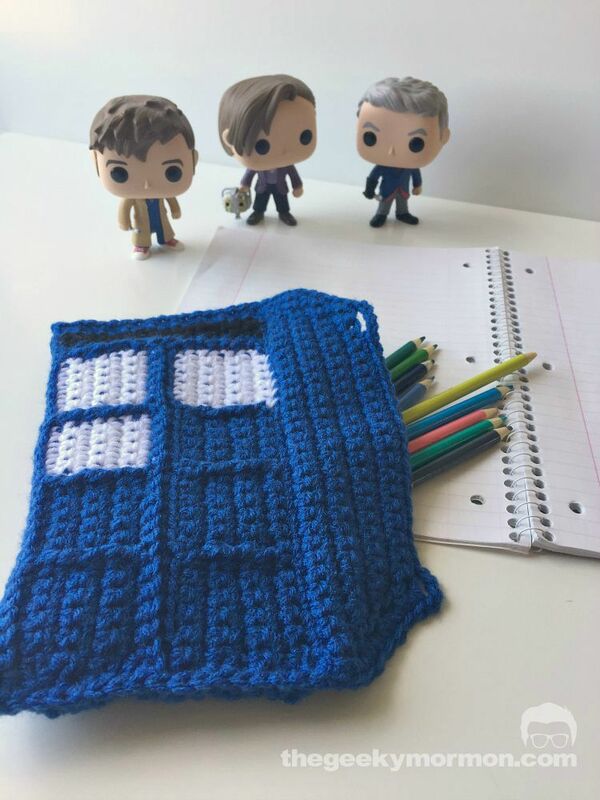 Today I am sharing the pattern for a crocheted TARDIS pencil bag. Last year I shared a Ninja Turtle pencil bag as my very first geek-craft and since school it is back to school time again I thought another pencil bag would be a good idea. 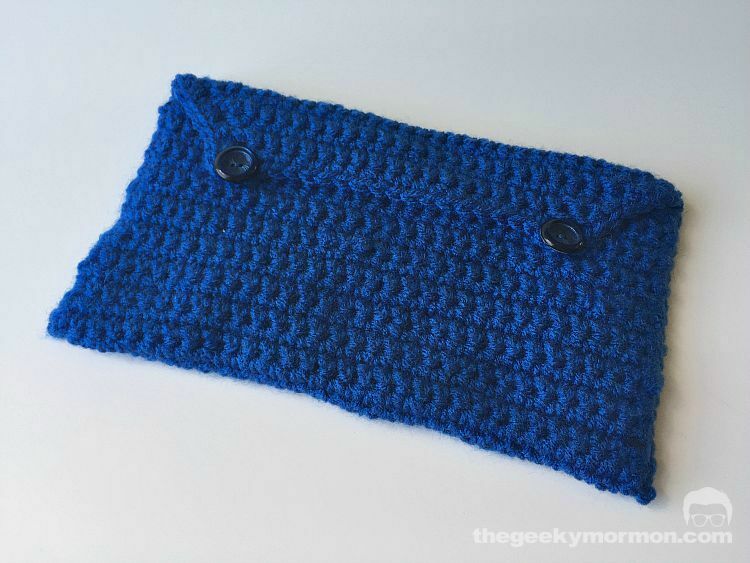 The pattern is similar to the Ninja Turtle bag, this year on my blog I have shared a basic pencil bag pattern based on the Ninja Turtle as well as a couple of other variations. 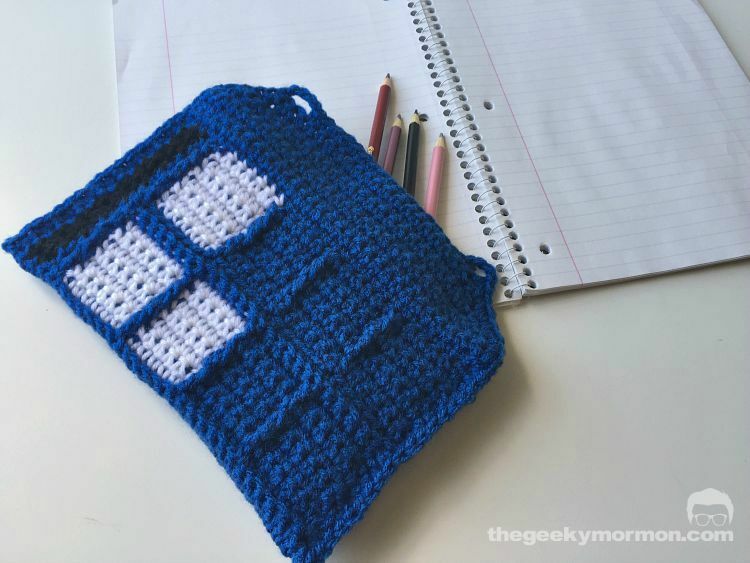 When I was trying to think of another geeky themed bag the TARDIS seemed like an obvious choice since it is already a rectangular shape. The tricky part was trying to add the texture to the doors and windows so that it looked like the TARDIS. 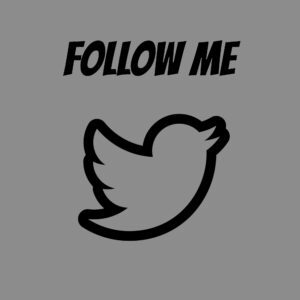 I used a combination of front loop only (flo), back look only (blo), front post (fpsc), and back post (bpsc) to create the texture. I also used a few color changes to show the windows and the signs. 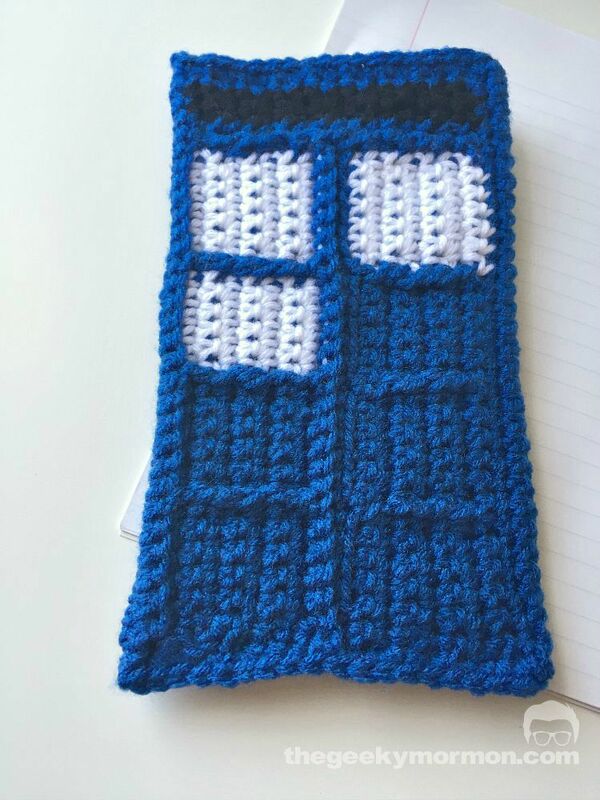 If you want to you could embroider the words POLICE BOX on the black strip and window panes on the windows so make it look even more like the TARDIS. The back has a simple button flap closure just like the Ninja Turtle bag. Finish off, You should now have a rectangle that has one end that is slightly angled on each corner, that is the flap. 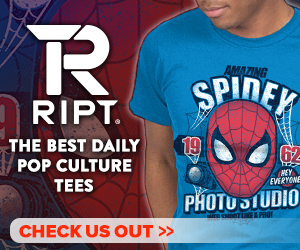 Half of your rectangle will be plain and half will have the TARDIS design. The plain section is the back and the TARDIS side is the front. 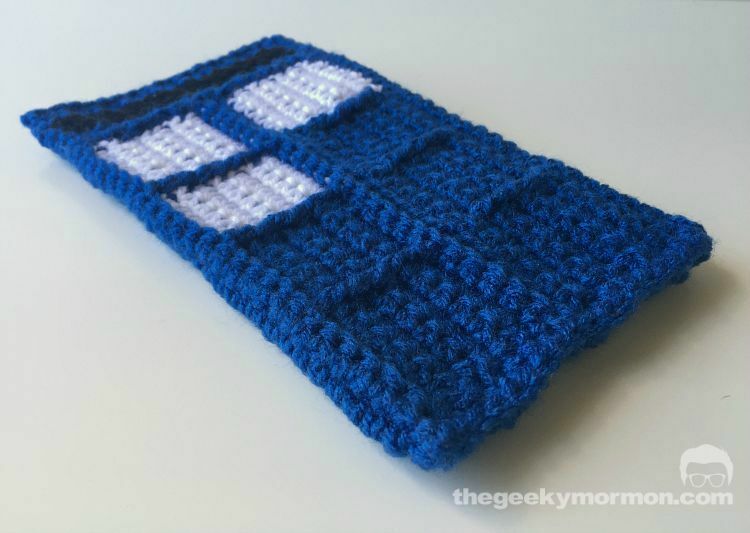 Fold your rectangle so that wrong sides are together and 18 rows are on the back and they are matched up with the 18 rows of the front that make up the TARDIS. Starting in one corner, sc evenly up one side of the bag through both layers, continue to sc up the side of the flap, when you reach the corner sc in the corner, ch 4, skip 1, sc in 16, ch 4, skip 1, sc in the other corner of the flap, sc evenly down the side of the flap and the bag being sure to go through both layers of the bag. When you reach the end finish off and weave in ends. Fold the flap shut to figure out where the buttons need to be placed. Sew them on, sewing thread and a small needle are usually easiest for this. Now you just need to fill up your bag and enjoy. Erica lives in Salt Lake City with her husband and 5 children. She started crafting at a young age and enjoys crochet, sewing, embroidery and more. She now shares many of the crafts she makes, along with free patterns and tutorials, on her blog 5 Little Monsters. 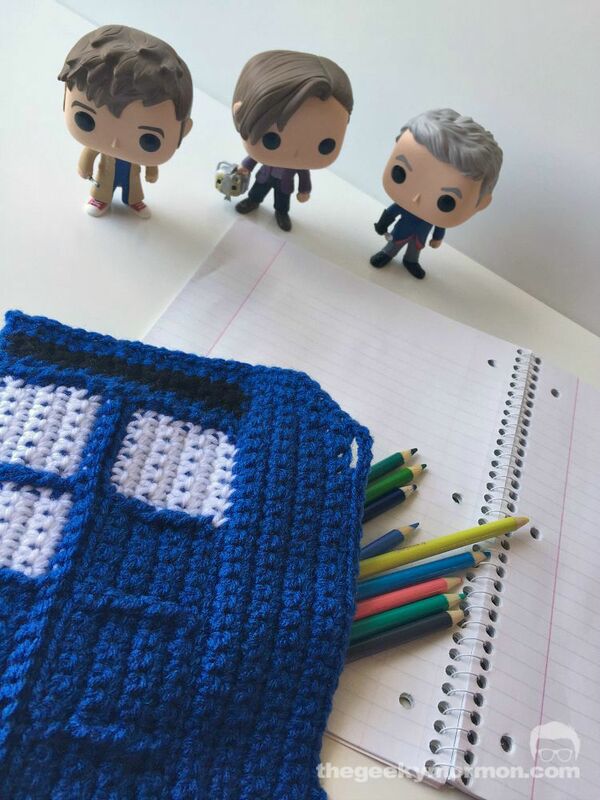 This entry was posted in Geek-Craft, The Doctor 101- Doctor Who and tagged Doctor Who, Geek Craft on August 13, 2015 by Erica Dietz.